Barclays CEO Antony Jenkins has been ousted from the top job. 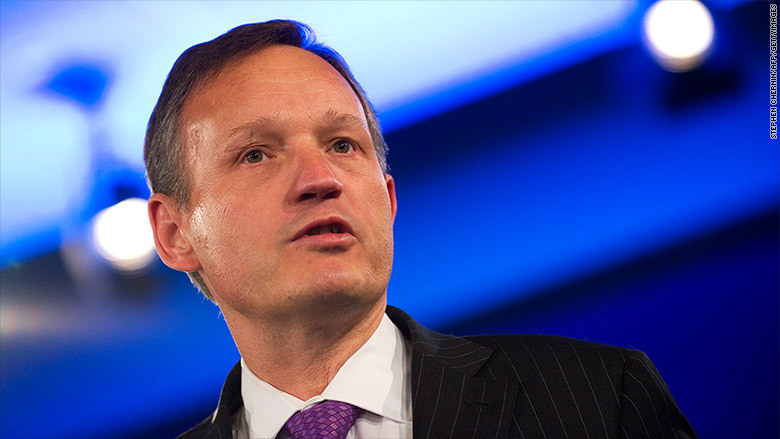 Barclays has ousted chief executive Antony Jenkins after just three years in the top job. Chairman John McFarlane will act as executive chairman until a new CEO is appointed. The British bank, which operates retail and investment divisions, said the move doesn't signal a major change in its strategy, but that fresh leadership was needed. "It became clear to all of us that a new set of skills were required for the period ahead," Barclays deputy chairman Michael Rake said in a statement Wednesday. Investors appeared happy with the leadership shuffle -- Barclays (BCLYF) shares climbed 3% in London trading. Accendo Markets analyst Mike van Dulken said the positive share reaction indicates market "optimism that [Jenkins'] replacement can better satisfy the board on the financial performance and strategic change front." Jenkins had been pushing through a major overhaul of the firm, which included massive job cuts, designed to repair the bank's finances and restore its reputation following a series of scandals. The former head of Barclays (BCLYF) retail bank took the reins from Bob Diamond in the wake of the Libor rate-rigging scandal that has cost the bank billions in fines. American-born Diamond resigned as CEO in 2012 after the bank admitted that its employees conspired to manipulate the London interbank offered rate, or Libor, which is used to determine the interest paid on trillions of dollars worth of loans worldwide. At the time, Jenkins asked not to be awarded a bonus for 2012 given his shared responsibility for many of the bank's problems. "It is easy to forget just how bad things were three years ago both for our industry and even more so for us," Jenkins said in Wednesday's statement.